Recently while studying Matthew 8, I started wondering about the story of the demon possessed men. 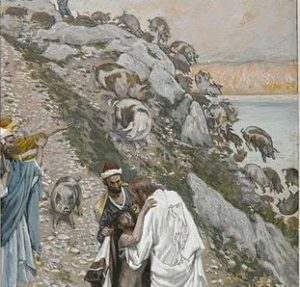 32 He said to them, “Go!” So they came out and went into the pigs, and the whole herd rushed down the steep bank into the lake and died in the water. 33 Those tending the pigs ran off, went into the town and reported all this, including what had happened to the demon-possessed men. 34 Then the whole town went out to meet Jesus. And when they saw him, they pleaded with him to leave their region (NIV Translation). As usual, I went looking for the art, and found a great piece. Here’s James Tissot’s watercolor, “The Swine Driven into the Sea.” In this story Jesus drives demons out of two men. The demons beg Jesus to send them into a herd of pigs instead of back to the pit of hell. Jesus, granting their request, sends them into a nearby herd of pigs. The pigs immediately run off a cliff and drown in the sea. When the townspeople find out what Jesus has done, they come out to see for themselves. You would think they would be impressed! There sit men who were formerly completely crazy, clothed and in their right mind. They have finally found peace, and their lives have been restored by Christ. But no. Instead these good townsfolk ask Jesus to leave. This Jesus is scary. He deals with demons, drowns pigs, and puts their cash crop on the ocean bottom. Apparently their life choice is to prefer their pigs to Jesus. Now don’t get me wrong. I appreciate pigs just as much as the next guy. After all, I’m from North Carolina, and pork is serious business. Just say barbecue, and we all have our favorite style, place, and region. I am not overstating this. But Jesus was right there among these people, and they chose pigs over Him! Even I, a barbecue lover, am saddened by their ignorance and closed hearts. Then I start thinking about myself. What are the pigs in my life? What is it that I’m choosing over Jesus? When I pick up my phone to check social media instead of sitting down to a quiet time, I’m chasing the pigs. When I worry about things I can’t control, instead of recognizing Jesus as Lord over all situations, I’m courting the swine. When I freak out about the future, get bitter about a situation, or fail to forgive, I’m sleeping with the pigs and carry the scent. But even in my sorry state, Jesus is gracious to seek me out, forgive me, clean me up, and clothe me in righteousness. He lifts me out of my filth and makes me presentable by His own blood. So thank you Lord for Your love, mercy, and grace! And thank you to artists like Tissot who put words into paintings and bless us with their vision. Enjoy… and check your scent!